This bread conjures up childhood memories and comfort food. When I was little I loved toasting up a couple slices of soft, white bread then spreading them with butter and sprinkling them with cinnamon and sugar. This is the the totally sophisticated way of doing the same thing. It's actually reminiscent of a cinnamon roll at the same time...sans icing. Thin layers of soft, white bread that were brushed with a nutty, fragrant browned butter and then coated...literally, coated...with a cinnamon and sugar mixture flecked with freshly grated nutmeg. Cinnamon-Sugar toast's big sister. It's far too easy to keep pulling warm, inviting slices from the loaf and washing them down with coffee. Or cold milk. The kids also love it...both helping to make it and helping to eat it. Me thinks this is a fantastic hostess or housewarming gift, if you can plan accordingly. 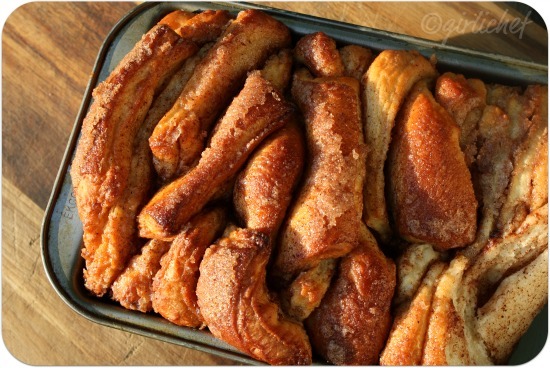 I mean, imagine opening the door to a warm, soft loaf of Cinnamon-Sugar Pull-Apart Ricotta Bread...the intoxicating smell calmly making itself at home the minute it goes through the door. Oh. Yes. 30 g. (2 Tbs.) unsalted butter, at room temp. 150 g. (~¾ c.) ricotta, at room temp. Dough: Combine dough ingredients in a large mixing bowl, the bowl of a stand mixer, or a bread machine. Mix to combine, then knead the dough (either by hand, in stand mixer) until the dough is soft and smooth and very elastic (~15 minutes by hand or ~10 in mixer). Or stick it in the bread machine on dough cycle and let it do its thing. The dough will be slightly sticky. Transfer the dough to a lightly oiled bowl and cover with plastic wrap. Let rise at room temperature until it doubles in size, ~1-1½ hours. In bread machine, it will beep at you when it's done. Filling: Whisk together the sugar, cinnamon and nutmeg. Melt the butter until it begins to brown and smell all nutty and amazing. Grease and flour a loaf pan (~9" x 5" x 2"-ish). Set everything aside. Putting it all together: Deflate the risen dough and knead ~2 Tbs. of flour into the dough. Cover with a clean kitchen towel or plastic and let rest for 5 minutes. On a lightly floured work surface, use a rolling pin to roll the dough out. The dough should be ~12" h x ~20" w. No worries if your rectangle isn't exact. My edges were a bit rounded and shorter, but I think that adds to its rustic charm. Use a pastry brush to spread all of the browned butter across the top of the dough, edge to edge. 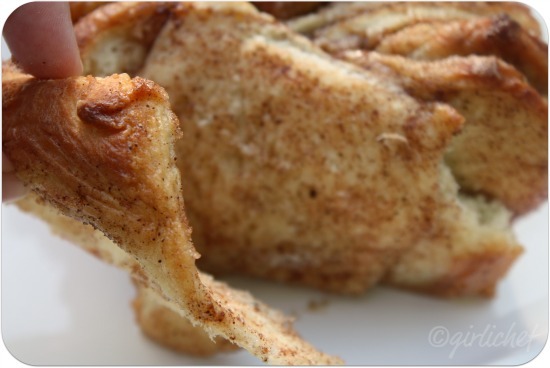 Sprinkle with all of the sugar, cinnamon, & nutmeg mixture. Slice the dough vertically, into six equal-sized strips. Stack the strips on top of one another and slice the stack into six "equal" slices once again. You'll have six stacks of six squares. Layer the squares of dough in the loaf pan. Place a towel or some plastic wrap over the loaf pan and allow to rise in a warm place for 30-45 minutes or until almost doubled in size. Preheat oven to 375° F during last 15 minutes of rise time. Slide loaf onto center oven rack and bake for 30-35 minutes, until the top is a deep, golden brown. Don't be tempted to take it out to early or the center will still be doughy. If you think it's getting burnt, slide a sheet of tinfoil over the top. Remove from oven and cool in pan on rack for ~30 minutes. Slide a butter knife around the edges of the pan to loosen the bread, then invert it onto a clean board. Place a serving plate or another clean cutting board on top of the upside down loaf, then quickly and carefully flip it so that it's right side up. This is most definitely at its best when it's still warm from the oven, but it can be kept at room temperature for a couple of days if wrapped or covered. Que cosa tan deliciosa y fabulosa, tiene que estar lleno de sabor. Ok I think I could eat the whole loaf! I could taste this now! Looks delicious! what a fantastic sweet treat of a bread, Heather! Mmmm, straight out of the oven and smothered with creamy butter . . . oh wow! I will be sending you my Food n Flix post tonight after dinner since we are making it for our Memorial Day dinner . . . a Tuscan specialty that requires a grill! Yum! I remember eating the white bread like that when I was a kid too. Definitely have to give this a try! Oh me oh my would I tear that thing to pieces!! Omg, bread looks simply out of the world..Marvellous! 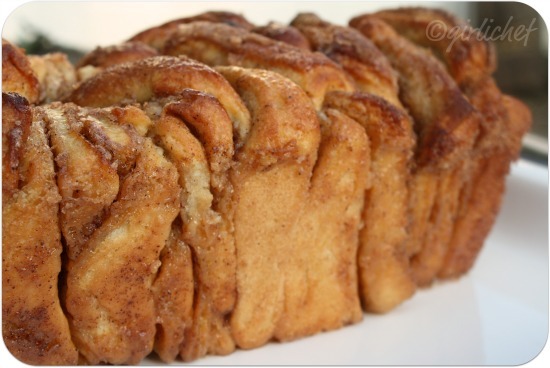 Everytime I see this pull apart bread it makes my mouth water, delish for sure. I love the photo of your son peaking over the bowl! Great looking bread that would be a hit in anyone's kitchen. This looks SO GOOD. Think i could sub homemade yogurt to the ricotta? @Miranda...I'm not entirely sure. You could surely try. Ricotta is so darn simple to make, though...that I would just run with it. But if you do try it, I'd love to know how it turns out! Good idea to use the ricotta. The recipe I made a couple weeks ago called for a lot of butter. It tasted very good, but I thought I wouldn't make it often because the butter. That loaf should be X rated. I so want to spring out of my recliner and make it. Good thing I'm too comfortable right now. That bread looks absolutely amazing! This is the year that I will overcome my fear of yeast and then I can make wonderful, amazing bread like this one. Yum! Heather, this truly looks beyond the most addictives of addictives. I really want to make it...but i'm kind of scared I won't be able to stop eating it once I do! This pull apart bread looks awesome perfect, your prince is cute. Wow, great bread! Love the layering too - I could pull on this till it's all gone! I love the way you made it into a loaf, very good. It looks delicious and I am drooling! Thanks for sharing and hope you are having a great day! This sounds so delicious! 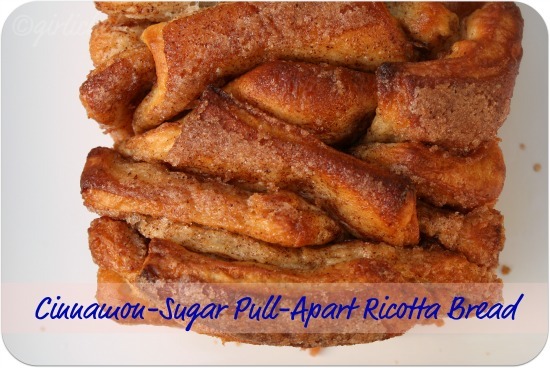 I love that there is ricotta in the dough! Thanks so much for linking up to Tasty Tuesdays. ps I have another giveaway! oh how i wish i could pull off a big chunk of that heavenly bread! DELICIOUS! Yum!! 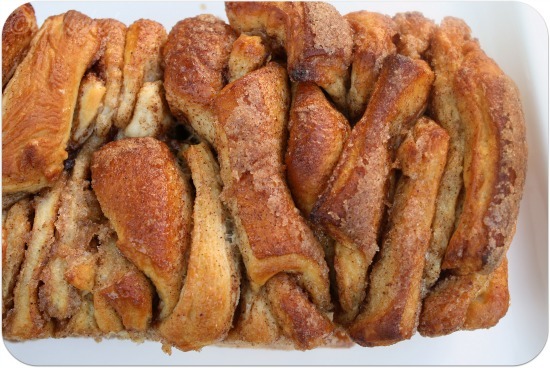 We referred to this as monkey bread when we were kids. I'll probably need to go make some of this so I can stop thinking about it already! I love fresh baked bread ! I didn't realize you could put ricotta in it, but I may have to try it! Thanks for sharing. That insanely delicious pan of bread would last mere moments in our kitchen. Wow! Have I ever mentioned you need to come for a visit?? Great post Heather and thanks for sharing at the hearth and soul hop. oh my gawd monkey bread! orgasmic! Your images of food are so good. They are not stark and stoic they are textured and gooey and make you want to grab it! I'm hosting a part this weekend, but the potluck follows a morning of floating the river. I will not be around for rising dough! Do you think i could do the rising and all that the day before and stack the pieces into the pan but then REFRIGERATE IT? to be baked the next day? I've done the 'no knead' let it proof in the fridge thing before... not sure what step this bread would prefer being refrigerated. Ideas??? Ooooh mama, I need to eat this.. so comforting. I can feel the sugar crunching under my teeth as I ravage the bread..
Wow! I need some of this delicious looking bread! Oh my dear, this is a loaf to die for! Thank you for participating in BBD #40! Good morning! Thanks for posting this! I just made this for my household. Prepped it last night, then let it rise in the fridge overnight before baking this morning. I was wondering if you had any tips for keeping the sugar mixture stuck to the dough. 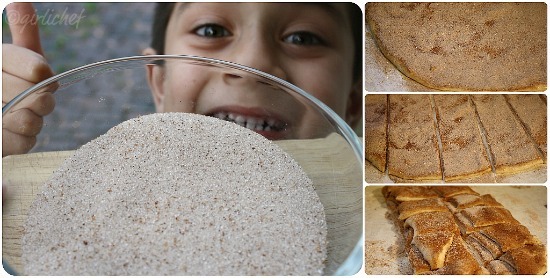 When I was cutting it up into squares, a lot of the sugar/cinnamon mix fell off & I just left it off. I guess I could have just swept it back onto the dough, but it seems like there may be an easier way? The result is OK, but not fantastic. BTW, just started reading more comments. I cut up the stacks and got the entire loaf prepped the night before. @Cara...most of my sugar mixture stuck the the dough, but yeah, what didn't we just swept over the loaf once we stacked it in the pan (good job for the kiddos...). Sorry it wasn't fantastic for you like it was for us. What a wonderful bread... just stunning and mouthwatering!! I will have get it on my to-do list!!! Mmmmm this looks and sounds absolutly wonderful. 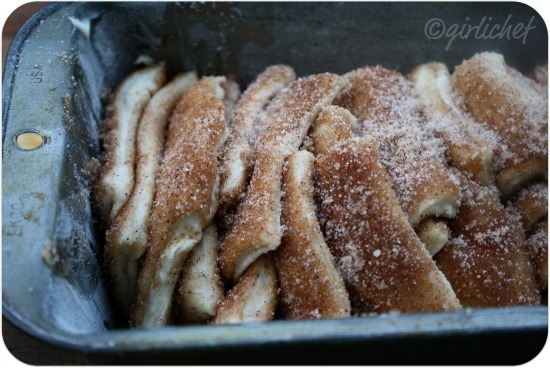 Now I am craving something with the cinnamon, sugar combination. :) Lovely pictures too! Oh my god. That is AMAZING! Shut the front door! I didn't knowcinnamon toast had a big sister. I'm all over this! I've just made this. OH MY. It's so delicious! My only big change was using coconut milk (because I had an open can). And I am not sure about the conversions in the recipe - I used 2 x 7g sachets of yeast, which was well over a tablespoon, and I certainly wouldn't have wanted to add a 3rd sachet to make it closer to 20g. ...ich habe ihn vor einer woche "entdeckt", heute gebacken. ich werde wahnsinnig,ganz was leckeres!